Crafted in 316L Stainless Steel - non-tarnishing! 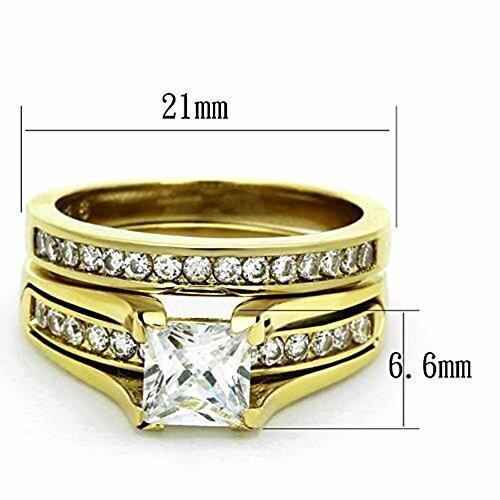 A Gorgeous and Elegant 2 piece ring set design made of 316L Non-Tarnishing Stainless Steel which is durable, won't fade, discolor or leave green or gray colored stains on your finger. Lavishly layered in a precious metal of 14K Yellow Gold plating and then polished to a mirrored-finish! 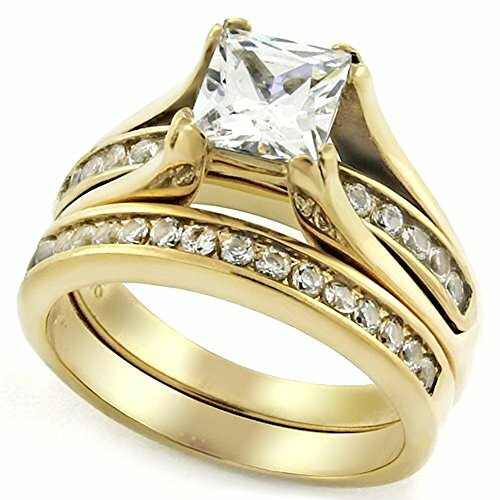 This Sparkling Stainless Steel Wedding Set is Stamped with a "316L" quality mark for authenticity. Displaying a (6.5mm) 1.00 Carat AAAAA Grade Princess Cut "Facet On Fire" Diamond Simulant Cz Center, which is beautifully raised over round brilliant cut accents located below, which are also adorning the matching band. 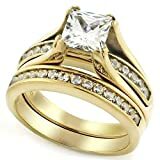 With this piece you get the best of both diamond shapes - the Classic and Elegant Square shape as well as the popular and still the most preferred diamond shape the Round Brilliant. In Sunlight or Candlelight... Our Stones are cut (faceted) for "Fire" and are GUARANTEED to be Blindingly Gorgeous by day and Breathtakingly Beautiful by night or your money back! Total carat weight: 1.00 ct center stone + accents = 1.85 Total Carats. Both Bands when worn together measure: 9mm in width.